Antonio Pappano conducts a new production of Bellini’s operatic masterpiece, directed by Àlex Ollé of La Fura dels Baus. Henrik Nánási conducts a cast including Javier Camarena, Daniela Mack and Vito Priante in this revival of The Royal Opera’s sparkling production of Rossini’s The Barber of Seville. The annual Meet the Young Artists Week gives audiences a chance to meet the new intake of the stars of tomorrow, and hear them perform with those continuing for their second season. Vlada Borovko, Francesca Chiejina, Jennifer Davis, Emily Edmonds, Angela Simkin, Thomas Atkins, David Junghoon Kim, Gyula Nagy and Simon Shibambu perform operatic arias and ensembles, accompanied by David Gowland, Nick Fletcher and James Hendry. Gerard Jones works with Angela Simkin, Gyula Nagy and Simon Shibambu on Handel’s Oreste, which the Programme will present at Wilton’s Music Hall in November. Two separate events presented by all the available Young Artists: the audience at the lunchtime session choose the repertory for the evening recital, followed by an opportunity to meet the Young Artists over a glass of wine. Award-winning South African theatre company Isango Ensemble tell the true story of a young refugee’s journey through Africa, based on the book by Jonny Steinberg. Barrie Kosky makes his Royal Opera debut with a new production of Shostakovich’s surrealist satire, conducted by Ingo Metzmacher and translated by David Pountney. See the Jette Parker Young Artists in a blackly comic production of Handel’s masterful pasticcio, in the atmospheric setting of Wilton’s Music Hall. Antonio Pappano conducts Sondra Radvanovsky and Aleksandrs Antonenko in the first revival of Jonathan Kent’s thought-provoking production of Puccini’s first operatic triumph. The first revival of David Bösch’s new production for The Royal Opera, with two casts including Maria Agresta, Roberto Alagna, Lianna Haroutounian, Anita Rachvelishvili and Dmitri Hvorostovsky. George Benjamin conducts a superb cast in The Royal Opera’s first revival of his and Martin Crimp’s highly acclaimed opera– an unmissable event in contemporary music. Joyce El-Khoury, Ekaterina Bakanova and Corinne Winters lead three excellent casts in Richard Eyre’s much-loved production of Verdi’s most famous opera. Kasper Holten makes his farewell as The Royal Opera’s Director of Opera with Wagner’s comic opera, conducted by Antonio Pappano and starring Bryn Terfel. Antonio Pappano and Renato Balsadonna conduct two great casts led by Ermonela Jaho and Ana María Martínez in Puccini’s deeply poignant opera. Bertrand de Billy conducts a cast led by Bryan Hymel and Krassimira Stoyanova in Nicholas Hytner’s acclaimed production of Verdi’s opera on love, ambition and intrigue in 16th-century Spain. The iconic Indian musician Ravi Shankar is celebrated in a major new touring project, a co-production between The Royal Opera and London Philharmonic Orchestra in association with Curve Theatre, Leicester. More details to be announced in due course. Laurent Pelly’s sunny production of Donizetti’s joyous opera returns with two world-class casts, led by Pretty Yende and Rolando Villazón, and Aleksandra Kurzak and Roberto Alagna. Antonio Pappano conducts a new production of Verdi’s thrilling Shakespeare-inspired opera directed by Keith Warner, starring Jonas Kaufmann and Gregory Kunde in the title role. Christophe Rousset conducts an excellent cast including Albina Shagimuratova, Bejun Mehta, Lucy Crowe and Michael Spyres in Graham Vick’s acclaimed production of Mozart’s early opera. Christine Goerke and Lise Lindstrom take the title role in Andrei Serban’s striking staging of Puccini’s final opera. The annual summer showcase given by the Jette Parker Young Artists is an unmissable highlight for anyone interested in the work of some of the most talented emerging performers on the operatic stage. Norma with a not belcantista prima donna . Wow. That is interesting! Good luck! You're complaining about the most famous singer in the opera world today making her role debut? If you have followed Netrebko's career, you will know that she has moved well beyond 'bellcanto' as her voice has gained depth. She truly is amazing and one of the top sopranos today. Sammy, I love Netrebko but her rendition of pure belcanto roles is not perfect. And Norma, is a monstre title, which requires a truly belcanto specialist. Maria, I have followed Netrebko, and as I was very much doubting about her Anna Bolena, which underlined her not perfect coloratura, I am doubting about her Norma, which is even a harder role. That said, let's see. I agree. I was not impressed with her Lucia at the Met several years ago. Hard to imagine Kaufmann as Otello. Maybe my favorite opera and love Jonas' singing. Should be interesting. Very excited about the new season. Highlight for me will be Otello , would also like see Norma. Can't wait ! The dates listed next to the singers for Otello do not match up with the dates listed for the performances. Thanks for your comment. I think the dates should be correct – could you let us know if you still there's a problem? Excited about the new season! However, Norma with Angela Gheorghiu would have been a much much better choice!! Oh no it wouldn't! Whatever one might think of Netrebko in bel canto roles, at least you'll be able to hear her. Yep, I think Angela Gheorghiu is a much better Norma. yesssssssssssssss.ANGELA its NORMA,NETREBKO will be just the shadow,but the games with the casts are always complicated for people with personal interests and sympaties. No way. Gheorghiu probably won't even turn up. Thankfully there is also the excellent Ms Bassenz cast as Adriana Lecouvreur should there be a no-show from Gheorghiu, who has just pulled out of her own recital at Royal Festival Hall this month. What a dismal lot: FOUR works by the tedious Verdi, lots of crowd-pleasing stuff and only one Wagner, an apparently new production by the awful Kaspar Holten, who will no doubt do his nicest to screw up Die Meistersinger. At least there's Renee Fleming in Rosenkavalier, the one highlight of the season for me. God this just sounds like empty complaining. Verdi is a genius and some of the casts look interesting, Holten is leaving soon so you should be able to deal with one last production (and quite frankly his productions aren't that bad, especially compared to some other productions of the same opera), and the ROH has almost never put on more than one or two Wagner operas so this should hardly be a suprise. And Fleming is the highlight? The woman has been unsuccessful and literally everything she has done the past few seasons are there are several women far superior (and in their primes) to her in this role. And Verdi can hardly be said to be 'tedious ' - especially not OTELLO. It doesn't sound like the ideal role for Jonas Kaufmann.......will be interesting! !! I love Verdi but my one criticism here would be that it seems a bit soon to bring back the Trovatore we have not even seen for the first time yet. I am particularly pleased to see The Nose and Norma listed and there are a lot of other things I will want to see although not everything is to my taste, but then I don't expect it to be because not everyone wants the same as me. Is your attitude to all of life SO negative? Perhaps you are above "crowd pleasers" but the crowd buys tickets too! Missed my stop in tube reading the opera season!! Some intriguing productions and a couple of prosaic ones I think. Curious to hear Netrebko as Norma because it requires really huge technical accuracy - and I've heard her earlier, lighter voice which was not really suited for the bel canto technical demands of accuracy and speed and she's been going the dramatic route lately but she's a great singer and I'd imagine is up for the challenge! And no Joyce DiDonato which is tragic. Still fab news about Pappano renewing his contract - imo best opera conductor around! All in all a season worth visiting!! Thanks for your comment. On the page we were just using 'Jun' to refer to all the dates in June but I see that's confusing – amended now. Who are these singers in Cosi? Covent Garden if you claim to be world class you need world class casting. Looks like an exciting season, some of the old classics with great casts. But also, thank you, thank you and thank you for bringing back Written on Skin! I can't wait to see it again. Plus a new Thomas Ades, The Exterminating Angel. Kaufman singing Otello.....interesting. Not a tenor I would have associated with the role at this point in his career. Much to look forward to here, in addition to Otello; Rosenkavalier for Christmas, The Nose, Meistersinger, Don Carlo, and Mitridate and Cosi. Exceptional upcoming programme and thanks for the early heads up, it means we can now plan our lives for the year ahead. I can't see that anyway could have cause for complaint about this programme or castings. I just hope the directors are up to the challenges. Disappointed that Meistersinger is not being live screened for those of us who can't afford to travel to London & pay for a hotel. Well they can't live cast everything in order to suite everyone who MAY decide to go to a live cast. Well said Ms Weaver! We live 250 miles from London and have to have an overnight stay. Also can't afford to be a 'Friend" and ensure tickets through "Priority booking" and therefore secure cheap rail tickets that are now released 28 weeks before travel. Would also liked to have seen "...Rosenkav..." in cinema. Still, will be able to see "Norma", "Cosi..." "...Hoffman" and "Otello" in cinema. I've a ticket for Tannhaeuser for around £20 and a return coach ticket from Cardiff for £10. I wonder if cinemas are disinclined to devote six hours of their schedules to a work as long as Meistersinger, or four hours to Rosenkavalier. Maybe that's behind the decision here. Matthew Rose as Baron Ochs. Yes! Really looking forward to that. Lots of amazing sopranos, I am very excited for this coming year at the ROH! Looks like I became a 'friend' at just the right time!! Thomas Allen is in his 60s and unsurprisingly does not sing much anymore. What exactly would you cast him in? Wonderful news about Antonio Pappano renewing his contract. JK singing Otello will be my highlight. Disappointed not to see "Das Liebesverbot" on the list. Had suspicions when Kasper Holten announced his departure that the Holten/Teatro Real, Madrid collaboration would not translate to the ROH. Can I hope for 2017/2018? Co-productions often take more than a season to make their way between venues; for instance, Bieto's Fidelio was at Munich is 2010-11, but took till 2013-14 to reach ENO. So I see no reason for you to give up hope. As I understand it, opera houses plan schedules several years in advance, so that Holten's leadership may be felt for a couple of seasons to come. I saw a Liebesverbot in Leipzig a couple of years ago. I must say, the early Wagner I think really deserves a London staging is Die Feen. Looks like a very strong, confident and rich season. Thanks, Kasper! I need to book as early as possible for 06.05.2017 for L'elisir D'Amore to see Pretty Yende people will be travelling form S Africa for the performance when may the booking be open please? General booking for this production opens on 24 January 2017 at 9am. Booking dates vary according to your membership level. On the production page, to the left of the black box that reads 'NOT ON SALE', click the 'Why?' icon to find out each booking date. General Booking opens on 24 January 2017. Friends of Covent Garden are able to book earlier on 7 December 2016. I don't mean this to be aggressive but does the ROH have any plans to bring back Marina Poplavskaya? She was everywhere at the house for several years, in new productions, gala events and in all the publicity and then after her vocal problems (and then her pregnancy) she has completely disappeared from the operatic scene and is not planned for next season in London either. Given her history on the Jette Parker scheme and the ROH's heavy marketing of her, is she expected to come back at some point? Interesting but dread to think of the seat prices especially Otello! Most I ever paid was £65 to see Dame Joan in Anna Bolena worth every penny .Also guess most of the new productions will be crap regie which I would not attend for free!!! Oh, for heaven's sake. How can you KNOW that the productions are 'crap regie' until you see them?? Although I share your concern about the seat prices. A strong programme of acknowledged masterpieces and modern classics. My top choice is The Nose, which should be a hoot! My two 'criticisms': yet again, no Janacek - he really should be as much a necessity in any season as Mozart, Verdi, Wagner or Puccini; and on the whole, the programme appeals more to my desire to hear particular performers than the works they are performing. I recognise that not everyone is like me in this respect, but I do fear that opera might become too 'celebrity' obsessed, rather than aiming for the widest possible repertoire. Nevertheless, plenty to look forward to - thank you. Of course we have been promised a Janacek cycle in 2017-2020, but I agree, he should be a routine presence. Netrebko did Casta Diva well and O, mira Norma beautifully with Garanca in Baden almost ten years ago. DiDonato costars in the Met production. Radvanovsky, here as Manon, and Kunde, here as Otello, once did Norma wonderfully. Not sure if Radvanovsky is fit for the ingenue but Kunde as Otello is definitely a treat. He well managed both Otellos and outperforms Kaufmann vocally if not otherwise. Hoffmann won't be bad but Meistersinger might not equal Met's Morris and Polenzani version. Fleming and Davis appeared in Rodelina at the Met; good luck for the lady and the gentleman's pure countertenor voice is an absolute joy. Not least, hail to Maestro Pappano! Some excellent casting here and plenty of famous operas that I'll enjoy revisiting - Meistersinger, Rosenkavalier, Otello, to name but a few - as well as the relative rarities, The Nose and Mitridate, and the new Bunuel opera (as a film scholar by profession, I'm fascinated by operas based on films). I must say, cautiously, that I think there could be a slightly greater focus on rarities at Covent Garden. Ten of the operas in the new season have been at the ROH since 2013, while in the same period six of the others have been at ENO or Holland Park (and Rosenkavalier at Glyndebourne). I'm always happy to revisit the acknowledged great works of the medium, and I'm also aware that every time one sees a Traviata or Butterfly, someone in the audience is seeing it for the first time. That's part of your mandate. But I also think that you ought to devote more space to real rarities, either the neglected works by the great composers - Arabella or Daphne for Strauss, for instance - or the deserving neglected composers who tend to slip through the net. Cilea is one example, but German opera is more than Wagner and Strauss: how about Weber, Marschner and Goldmark, for starters? Rarities like King Roger did very well in the house, so there is an audience for a wider canon. I agree with Alexander that I would like to see more rarities. These are the sort of things that I will make great efforts to see (e.g. by going to Wexford) and I know a lot of other people who do the same. I realise that you have to do some "crowd-pleasers" but a few rarities as well would be nice rather than to keep having new productions of the same old operas, some of which are now into their third production since I started going regularly in 1993. Couldn't agree more. See my post September 6th. Is it really the intention that the "first night" of Butterfly should be a Thursday at 12 noon (ie 23 March)? I know that 20 March at 12 noon is marked as a schools matinee - has there been some mistake? Norma with Netrebko is the highlight. Also because of Joseph Calleja as Pollione. He should be perfect for this role. Some other strong casts too. Camarena in barbiere, Kaufmann in Otello, Spyres in Mitridate. Manon Lescaut, Trovatore and Don Carlo also have wonderful casts. But wait - No Keenlyside??? He is scheduled to perform three different operas in Vienna in the coming season plus a recital, but not a single performance in London? New Cosi and Rosenkavalier because I love them. Ermonela Jaho - great singing in trittico in 2016, matched by a gorgeous curtain call in character. It's always interesting when a revival of a production is announced before anyone has even seen it (Trovatore). Great to have the visually very imaginative Barrie Kosky doing a co-production with himself (he's Australian and runs the Komische Oper). It'll be in English at the ROH because it's a "Konversationsstück" and he wants the words understood. Cue minor controversy. Ermonela Jaho is back as Madama Butterfly, a must see. Rather agree with Alexander Jacoby about extending the rep, but there are some grand things in the season to which I am really looking forward. One being 'Adriana Lecouvreur'. And the new Thomas Adès. And 'The Nose'. And 'Oreste'. Big thank you to Kasper Holten & everyone involved in programming the 2016/17 season. John Schlesinger's Les Contes d'Hoffmann at age 36 is now the oldest production to be revived. I would prefer the opera house to revive some of the older generations not just simply replacing them or keep on reviving the recent ones. Why revive Trovatore when they haven't even got their first reaction? It would be so nice if we had that 1977 Fledermaus by Leopold Lindtberg, or Moshinsky's Samson et Dalila of 1981 back. And as someone is writing, obviously there are too many Traviatas. It's high time they did their first Ernani. Yes please- Moshinsky's 1981 Samson et Dalila. Looking forward to the new season - many new things I haven't seen before. I too was wondering why no Simon Keenlyside? Also seem to remember that Anna Netrebko has a bit of a reputation for cancelling so not too worried about whether her voice is suitable for Norma. On the subject of cinema screenings of longer operas I seem to remember Parsifal a couple of Christmases ago? In an ideal world everything would be accessible to everybody but sadly that's not the reality. I like upcoming season a lot. Unusual for ROH. Netrebko as Norma, Kaufmann as Otello, Bryan Hymel and Renee Fleming comes back, Shagimuratova as Aspasia- OMG, she is fantastic singer, remember her mesmerizing Donna Anna, future big star. Looking forward very much. Each to their own, but there is no need for rude comments. The Renee Fleming who sang at the Barbican last night, enthralled a full house with a wide variety of both programme and interpretation and was in brilliant, mesmerizing voice and gave countless, much demanded encores. I would eagerly buy tickets to hear her again. 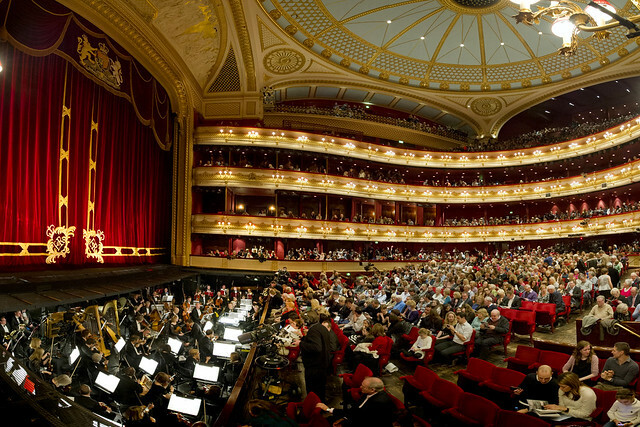 The ROH,as a music venue, provides a balanced season to balance the books, just as orchestras continue to perform works by the audience attracting Beethoven, Tchaikovsky and Rachmaninoff. On a different note, please convey huge congratulations to Messrs Pappano, Kaufmann and all involved in the award winning production of Aida. New season looks great! I'm happy with the casting PS Congratulations on the recent Oliver Award for 'Cav & Pag'! Oh please Fleming's performance last night was close to abysmal. This was not a world class singer anymore. Some of it quite embarrassing too. In all my years of concert going (near 30 years) I have never heard such a lazy performance of the Schumann. She mumbled words, struggled through most of it and as a singing performance was a mere shadow of her former self. Even worse her crooning meant that at times it sounded like a performance in a piano bar. The poor pianist struggled throughout the night to keep up with her erratic tempi. Sometimes too fast sometimes too slow. At the start of Zeignung this was cruelly exposed as she started way too fast and the pianist tried desperately to find the right tempo. Horrible. The American songs were weird and full of generalised nonsense. Her Morgen was good though, my favourite Strauss song. Despite all this I warmed to her as a person and forgave her everything when she introduced one of the songs called 'Scream' with 'this is dedicated to our election'. May we book for Don Carlo right now, please (among others)! Three great debuts:Anna-Norma, Anita-Azucena and Jonas-Otello!!! and Ermonela-Butterfly, so many Alagna, Agresta and Kunde!!!!! How many occasions to come to Roh!!!! The Exterminating Angel. Wow! How exciting! Love the film. Cant wait to see what this will be like. We know that "Traviata" is a banker, but so are "Carmen", "Figaro", "Tosca" and a few others. Can you cycle them round a bit rather than giving us the same production of Traviata every year? My wish list for next season: how about some Haydn or Janacek; or "Billy Budd"; or a revival of that fun "Cherubin" that we had about 20 years back! I kind of wonder myself - is Traviata really that much of a banker relative to other things? I mean, I see most of the operas at the ROH, and it's very rare that I sit in a house which isn't about 95% full. So is a Traviata any more of a sure-fire earner than lots of things? Still, it's accessible and entertaining and (important point) a good first opera - the sort of thing that may get new viewers interested in the medium. I gave Covent Garden a hard time over Lucia, but they've really cheered me up with this new season. My two favourite sopranos, Jaho and Radvanovsky, favourite tenor, Kaufmann - it's very exciting; his acting is always brilliant and I am sure he will be great - and the baritone whose professionalism puts us all to shame, the wonderful Hvorostovsky. (I'd like to have seen him in something I haven't seen him in before but that's a bit picky...). Glad to have a chance to scrabble for a ticket with everyone else, and I can put my Lucia refund to good use (!) It's clear there are as many different opinions as there are seats in the House, so let's hope we all come away happy at some point! Could you tell me which productions will have lower ticket prices (like L'etoile and Oedipe this season)? In the Autumn Season, The Royal Opera's new production of The Nose has tickets from £5 with a top price of £100. All ballets have tickets at £6 or less, with prices for the Wayne McGregor mixed programme from just £3. Across the Season half of all tickets cost less than £60, One third of tickets will cost £36 or below and more than a quarter of a million tickets will be priced at less than £45. others. Might have to travel. It doesn't have to be 16th century. It doesn't have to be Nuremberg. But it does have to find the inclusiveness and humanity to embrace everyone who is willing. At ENO, at the very end, that even included Beckmesser. Very interesting programme for 2016/2017. But where is maestro Placido Domingo? My mother is very disappointed. Will he ever do those two cancelled dates as Germont in La Traviata? Will you consider him for doing a Concert like Jonas Kaufmann. I think ROH is wise not including Domingo. It is time he stood aside and allowed us all to remember the miracle of his 30 years of world-class singing which we were so privileged to enjoy. Personally, I'm looking forward to seeing Kaufmann's debut as Otello; his recording of two of the arias showed considerable potential. Some exciting things to look forward to, including Norma.Otello, Written in Skin and Exterminating Angel, but no Joyce di Donato and yet again no Nina Stemme. I am responding to a previous comment of " its time he stood aside" ( Maestro Placido Domingo) I do not think so his singing and acting on stage is the best. There must be many people who think the same, proved today by the sell out of Nabucco performances by Placido Domingo. Please have him back soon. Looking forward to Norma (not sure how the combination of Netrebko and the Fura dels Baus will go down), Rosenkavalier for Xmas (despite Renee now way past form), Don Carlo and Jonas as Otello, which I hope he sees through and does not cancel. He can do the role justice and I hope he does Tristan soon, too! Otello and Turandot both seem to be on the same dates -8, 12, 15 July. Turandello? What happened to Netrebko as Norma? Why has her name disappeared and the production photograph changed? No Yonghoon Lee? He is not singing at the Met either. What happened? Thank you for your feedback. Could you let me know which seats you feel have quadrupled? We offer different pricing to different productions and the ticket prices vary accordingly. With the extreme stalls circle seats no longer available because of the needs of our orchestra members, the number of seats in this area is smaller. Jonas in Otello!! Anna Netrebko as Norma Cool!!! I was very much looking forward to seeing Norma with Netrebko but was expecting her to cancel! Now I have read "Director's Viewpoint' and the "Career in Brief" of Alex Olle I think it explains why she pulled out!!! I would love to see this opera but do I want to pay £270 for another terrible production - although I am sure the singing and orchestra will be wonderful!!!! Hi, I would like to know if I can buy Opera season ticket packages 2016/2017. I would like to see 9 Operas. I think it would be more convenient for me to buy a package than single tickets. Thanks. Do get in touch if you have any problems. Well, I'd better get joined up as a friend, so that I can access earlier booking arrangements, because every time I look at this list, there's more I want to see. Excited by The Nose and The Exterminating Angel, Cosi and Mitridate, Otello, Rosenkavalier, Meistersinger, Don Carlos and Adriana Lecouvreur. That'll leave me tidily penniless! And the train-fare...... Oh well. Vissi d'arte. With regular emails from ROH appealing for more money as donations, despite being the single biggest beneficiary of the Arts Council, why do we need a new 'Rosenkavalier' when the current one is so magnificent? A Kaspar Holten-directed 'Meistersinger' is going to be contentious and, probably, not revivable so why waste the money? Graham Vick's production is decent. 2. Your invitation to comment is at the end of ALL the comments! Thanks for your comments; I agree, it would be more helpful if the ability to comment was higher up and this is something we will be looking into when we make further development changes to the site. We do still have the pictorial view of what is coming up - I have added a link to this view at the top of the article. Overall a good season although after just seeing La Bartoli in Edinburgh the Norma has got to go some!! I have to say in the days of cuts and economy there are/have been FIVE rather unnecessary new productions. La Boheme, Der Rosenkavlier, Otello, Cav and Pag and Il Trovotore. All previous productions were wonderful to watch and sumptuously staged. I have to question why,why,why? When there is so much else that has not been staged at ROH for many years. Il Pirate, Iris, Roberto Devereaux, Anna Bolena (last done in 70's with Sutherland), Osud, Rienzi, Daphne, Edgar, Thais (concert) and Le Cid to name but a few. We patrons want to see works we have not seen - not revamped of old favourites with strange 'new' conceptions. Could not agree more. When the arts are having to work with limited budgets why replace a good working production when the resources could be used to produce a new work not in the repertoire. Patrons usually go to see a work and not bothered to a large extent if it has older staging and would jump at seeing something new. In the perfect world it would be lovely to have new productions all the time but in the real world let's see some thing new and enjoy what we already have. Since Roberto Alagna announced on Sept. 28th that he would withdraw from "Il Trovatore" (1st –16 December), the ROH should quickly inform its patrons about the cast change, even if Mr. Alagna's substitute has not been confirmed yet. Thanks for your comment. The replacement for the role of Manrico will be announced soon, and ticket holders will be contacted via email with details of options open to them. When are we likely to see "La Boheme"? Would love the ROH to stage the Met's fabulous baroque feast of an opera " The Enchanted Island" with the same dream cast who brought the magic to NY. Any chance? Please....! Yours hopefully from an Early Music fan. We don't have any plans at present, but thanks for sharing. We love to hear from our audience on what they'd like to see staged. Remember that we will announce the 17/18 Season in April. I have enjoyed the Il Trovatore last tuesday in the Cinema in The Netherlands. For me it was the best Trovatore I have ever seen. Also the orchestra was superb. Would it be possible to release the performance on Bluray for commercial sale? I would buy it and I am not the only one. Regarding 'The Exterminating Angel', as the role of Yoli (boy treble) is uncredited, does it mean there will be no Yoli onstage? And what about the uncredited instruments (e.g. ondes Martenot, etc.)? Many thanks for your comment and for flagging that these credits were missing from the website. The role of Yoli is performed by Joshua Abrams and Jai Sai Mehta, who will appear onstage, and in the orchestra Cynthia Millar plays the ondes martenot and Finnegan Downie Dear the piano. These credits have now been added to the website and should show through within the next ten minutes. The Othelo in the cinema was magnificent. Desbdemona when you sang the prayer I was praying with you in my heart. I was so shocked at your death, and understood entirely why he gave his life. Their where all magnificent performances by each and all of you. Wonderful the portrayal of the human minds where spot on.